Provide comfort for the family of Frederic Parasch with a meaningful gesture of sympathy. 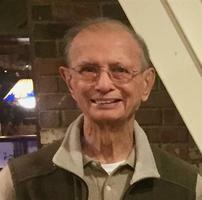 Frederic Albert Parasch, 87, of Simsbury, beloved husband of Frances Barbara (Walters) Parasch, died Monday, April 1, 2019 at his home. He was born April 22, 1931 in Dudelange, Luxembourg, son of the late Albert and Jeanne Désirée (Auffray) Parasch and had lived in Windsor prior to moving to Simsbury five years ago. Frederic was a graduate of City College of New York and continued his studies at Fairleigh Dickinson and Rutgers University. He worked for Otis Elevator Company for 42 years and held many engineering positions including Manager of Service Engineering prior to his retirement. He was a member of the Otis Elevator Retirement Group and was a Docent at the New England Air Museum for many years. Fred enjoyed skiing, hiking, traveling and photography. In addition to his loving wife of 55 years, he is survived by two daughters, Christine Daniels and her husband Dr. Richard Daniels of Deep River, CT and Susan Janssen and her husband Josephus “Joop” of Eindhoven, Netherlands; his brother, Guy Parasch, Sr. and his wife Marie of Endwell, NY and his grandchildren, Michael VanMeter, Andrew VanMeter, Matthew Daniels, Isabelle Janssen and Sophie Janssen. As well as, his brother-in-law Frederick Uhl of Bayville, NY, loving niece Christine Sivacek and husband Arthur of Bayville, NY and his godson Frederic Parasch and wife Marielle of Luxembourg. A memorial service to celebrate his life will be held at 4:00 PM on Saturday, April 6th at the Vincent Funeral Home, 880 Hopmeadow Street in Simsbury. In lieu of flowers, donations may be made to www.freshair.org an organization near and dear to Fred or to www.kidney.org . Please visit Fred’s “Book of Memories” at www.vincentfuneralhome.com for online condolences. Guy and Marie Parasch and Family sent flowers to the family of Frederic Albert Parasch. With sincere sympathy and with loving memories of Fred. He will always be in our hearts. Guy and Marie Parasch and Family purchased the The FTD Truly Loved Basket for the family of Frederic Parasch.